Propane gas is an alternative fuel used for heating homes and powering appliances. It is also used in industry. People who use propane for home heating are usually located in rural areas, according to the National Energy Education Development Project. Propane tanks are measured by their capacity. They have capacities ranging from 120 gallons to 500 gallons. 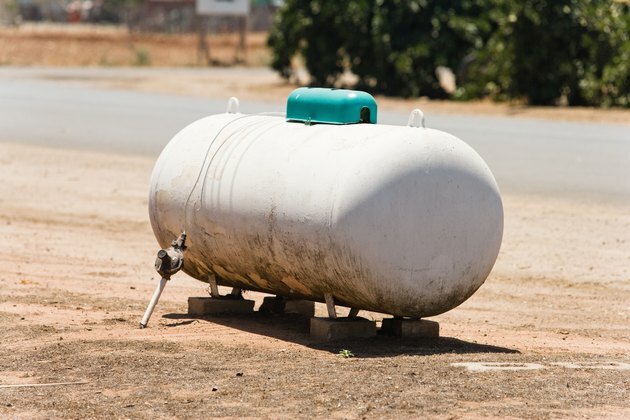 Depending on usage, a 500-gallon tank can provide enough propane to last a family of four up to one year. Some people install propane tanks belowground to keep them from view. Tank size is not an important consideration for some people. Those with residential propane tanks can schedule regular deliveries from a local supplier. This can make a smaller tank more suitable for your home than one with the largest capacity. One advantage of larger tanks is being able to purchase a large amount of propane when prices are low. Some suppliers may require you to order a minimum of 125 gallons per order if your tank holds more than 250 gallons. There is not a one-size-fits-all propane tank for residential use. A number of factors are important in determining what size to install. People living in warm climates use less propane for heat than those in colder climates. Other considerations include the home's square footage and the number of propane-powered appliances used. Tanks holding at least 125 gallons include gauges that allow you to estimate how much propane remains. This makes it easier to manage fuel supply. Vertical propane tanks holding 120 gallons are available for installation above ground. Larger tanks installed above ground are horizontal in shape and resemble small submarines. People can purchase horizontal aboveground tanks with fuel capacities of 250 or 500 gallons. Tanks for underground installation are available with fuel capacities of 250 gallons, 500 gallons or 1,000 gallons. Underground tank installation is complex so hire an experienced, reputable firm to do the work. Seek advice from the supplier before deciding on a tank size. A review of current home heating bills, if applicable, can help the supplier determine the right size for your home. Ask for contact information for three customers in your area who have homes similar in size to yours. Contact them to ask about the size of their tank and how often they refill it. Also, talk to them about the number of propane appliances in their home and how much they rely on it over the course of a year. The comparisons along with an analysis from the supplier should help you make an informed decision.